I recently joined a bread bakers’ group on Facebook, and have learned a tremendous amount from the global community that participates. There are people from almost every continent and every region in the world. And the camaraderie, encouragement, and connection in the group is pure magic. 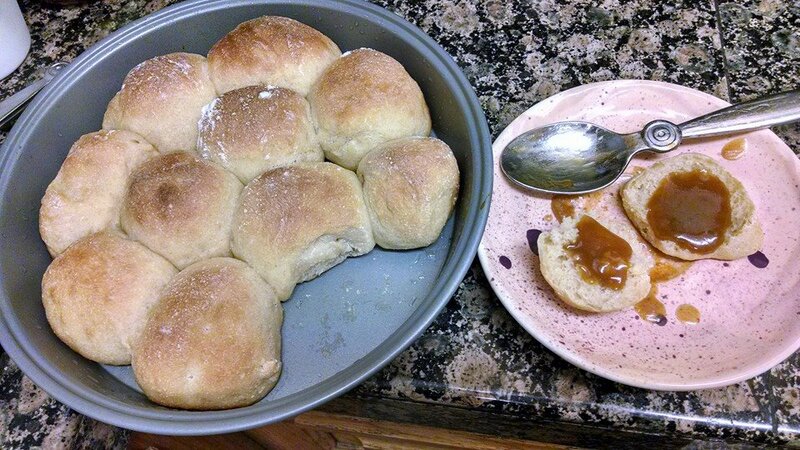 My friend Grace recently posted a beautiful picture of butter rolls: shiny, golden – and you can tell – soft. The thread that followed described southeast Asian cafe culture – the coffee shops are called kopi tiams – and the typical foods eaten at them. Curries with soft buttery rolls. Coconut jam. Lots of eggy things. It all sounded so delicious. And so veganizable. I created this curry based on a chicken and potato curry stuffing for buns I found, but changed it to be vegan, obviously, and to be eaten in a bowl, rather than stuffed into bread. You could just eat it over rice or with any kind of bread. It has a lot of depth and great texture, if I do say so myself. Place a large cast iron pan over slightly hotter than medium heat. Add the peanut oil, then add the tempeh, and saute until browned. Add the curry leaves, if using, and onions, stirring and sauteing until translucent. Add the garlic, and saute for another minute. Place the spices in a small bowl and add about a tablespoon of water to make a paste, stirring well. Push the contents of the pan aside to make a little room for the curry paste, and add the curry paste to the pan to get some direct pan contact for it, sort of toasting/frying it. Then mix the paste up with the rest of the pan’s contents. Add the potatoes, carrots, and veg stock, stirring well. Turn the heat up to medium-high, and bring to a boil. Once it’s boiling, turn the heat to medium-low, and cover. Let simmer for about 10 or 15 minutes, when potatoes and carrots are tender. Add the peas to the pan, increase the heat to medium, and cook, stirring, until heated through. Serve with soft rolls and coconut jam (recipes below). Place all of the dry ingredients in the bowl of a stand mixer. With the dough hook, mix for one minute on low speed. Add the yogurt and water and mix on low for about five minutes. Turn the speed to medium, and mix for another 7 or 8 minutes. Place the dough in an oiled bowl, and spread a little oil over the top. Let it rise for about an hour or two until doubled in bulk. Divide the dough into 40-gram pieces, and shape into balls. Let the dough rest on a floured board for about 15 minutes, then place in 9×13″ pan, cover, and let rise for another hour, until doubled in size. Preheat the oven to about 390 degrees. Bake for about 15 minutes until golden brown, and then let cool on a wire rack. Place ingredients in a medium saucepan over medium-high heat, and bring to a simmer. Turn heat to medium-low, and let simmer, stirring regularly, until the color is a dark chocolate brown, 2 to 3 hours. Spread on “butter” rolls. I’m back…with a recipe! PLUS We get requests.